Post subject: Re: [1.2.3] Eternal Darkness - A Full Necromancer Rework v2. Minor bug-Drain Life does not seem to be working properly. When I use it on targets, sometimes it will simply not affect them. Is this an effect you save against? If so, there's no message when they do save. Other than this, though, mod has been working great. Fantastic design. Drain Life checks cut resistance. Are you using it on enemies with cut resistance, such as jellies and skeletons? Quite possibly. I'm reporting this a few days later, so my memory's hazy on it. If this is the cause of it, would it be possible to add a message indicating the effect has been resisted? Or add to the skill's tooltip, explaining that's what it checks? Thank you. I'll make it more explicit that Drain Life is a Cut effect like Exsanguinate, and put a resisted message in. Then once more, thank you for your quick response and making this mod that much better. I tip my hat to you, Razakai. Can you update mod for 1.25? I just tried entering Elvala with the mod and got no errors. Can you take a look in your TE4_log.txt file and tell me the LUA error you're getting? Great work Razakai, it looks like Necromancy just got a lot more interesting and self-sufficient. Maybe we can finally stop hoping for a Celestial/Light tree from escorts and get by our own dark powers alone. I really like the idea of lichdom giving you a good spell straight away, without requiring you to wait ten more levels to get it going. Huh, I kinda forgot about this addon. It's probably horrendously broken now 1.3 has hit, I'll see if I can take a look and bring it up to date. I've mostly been focusing on trying to get my Deathknight class coded, might roll that up into this addon too. I played it with 1.3.1 for up to about level 20 and it seemed to work fine without any Lua errors, barring the Crimson tree being a bit weak-ish. I found where that bug is coming from. I'll have some free time at the weekend so I'll put in a fix then. There's also a reported bug with some Ashes content. Surprisingly I'm not seeing any other obvious bugs so hopefully those will be all. In terms of new content, this addon won't be receiving anything new except for bug fixing. However, once Deathknight is done (about halfway there...) I'm planning on making a re-reworked Necromancer to go into a brand new classpack for Necromancy-themed classes. This will be quite different to the Eternal Darkness Necromancer, more of a total reimagining rather than just tweaks and new trees like it is now. 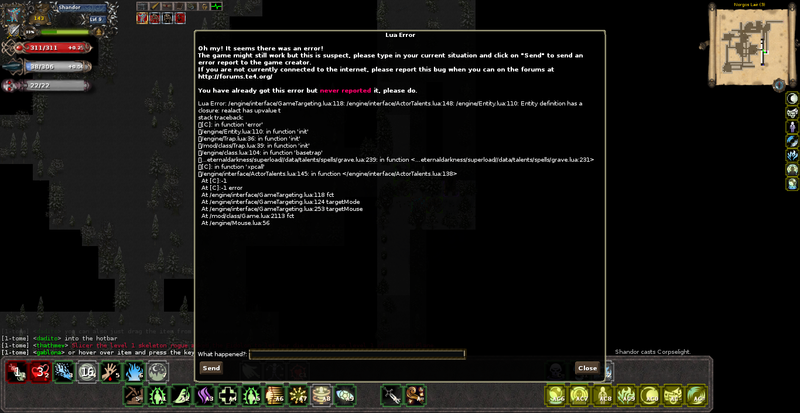 Unfortunately, I still get the crash from Eternal Darkness and Necromancy+ (with the N+ Necromancer changes disabled), as detailed in the last couple posts of the Necromancy+ topic. Posting here since HousePet said there's something in ED triggering it.